Bankhouse Farm Cottages are actually twelve cottages, with each cottage being a barn conversion. The cottages at Bankhouse Farm Cottages sleep between 2 and 8 people, and can be found in the small village of Guyzance near the Northumbria Heritage Coastline. The cottages are set in 35 acres of woodland and gardens - so whether you want to have a look at the local wildlife, or are just looking for a rural retreat, it's worth taking a look at Bankhouse Farm Cottages. The first cottage at Bankhouse Farm Cottages is Daisy Cottage; this cottage has one bedroom, and sleeps 2 people. Daisy Cottage makes a great accommodation to enjoy a romantic break. If you've got a pet in your household, you'll be pleased to hear you can bring your dog on holiday to Daisy Cottage. The second cottage to mention at Bankhouse Farm Cottages is Willow Cottage. This cottage sleeps 4 people in 2 bedrooms (1 double and 1 twin), so would make a great destination for a quiet family holiday. Like Daisy Cottage, you can also bring the family dog on holiday to Willow Cottage. The largest of the cottages at Bankhouse Farm Cottages is "Low Berry". This cottage sleeps 8 people, and is ideal if you're after a slightly larger holiday cottage. Should you want to share a rural retreat with friends, or family, Low Berry could be the cottage for you. Oh, and if you've got a dog - you'll be pleased to hear that Low Berry welcomes pets. Last but not least is Bluebell Cottage. Sleeping 3 people in a double and single bedroom, Bluebell Cottage makes a great holiday cottage for couples and smaller families. And like the other cottages at Bankhouse Farm Cottages, your dog is welcome to come along too. 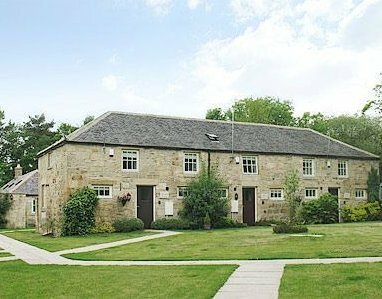 So, for a 4-star holiday or short break near an area of outstanding natural beauty in the north of England, have a little look at one of the cottages at Bankhouse Farm Cottages.